Wednesday, April 24th at 7:30pm. It's no wonder that Patrice Williamson has been compared to Ella Fitzgerald, because since hearing Fitzgerald sing "A Tisket A Tasket" (about that now famous yellow basket), she's been a lifelong devotee. Williamson has performed her "Celebrating Ella" concert to sold out crowds for years, including a spectacular CD release show on Fitzgerald's 100th Birthday on April 25th 2017, right here at the Regattabar. In celebration to Fitzgerald's enduring legacy as a jazz vocalist, Williamson partnered up with guitarist Jon Wheatley to record and release a beautiful recording highlighting Fitzgerald's work with Joe Pass. 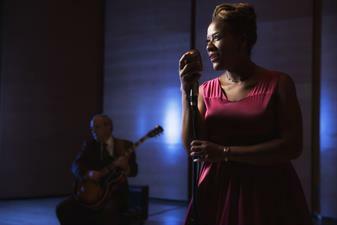 Williamson will return on April (24 or 25) with more of Ella Fitzgerald's hits and fan favorites.